At the brand new Pro Wrestling Tees retail store! 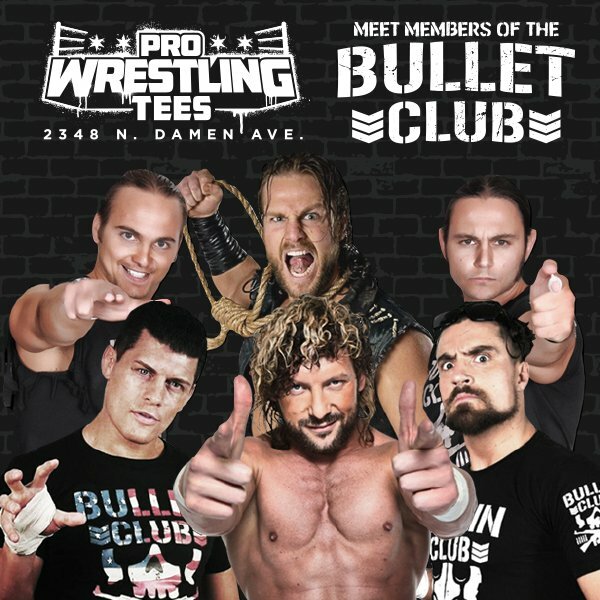 -Meet & Greet with all Bullet Club members. -Autographed 8×10’s (photos included). You may bring your own item. -Photograph using your own camera with 6 members of Bullet Club in same photo. -Exclusive “Bullet Club Chicago” Shirt S-5XL. Pick up with ticket at will call. You may bring ONE guest for the photo op and meet and greet. Guest will NOT receive shirt or autographs. You may bring ONE guest for the photo op and meet and greet. You MUST pickup your package starting at 8am at One Hour Tees (next door to Pro Wrestling Tees) 2348 N Damen Ave. Please make sure you have an ID and a print out of your ticket or the confirmation email on your phone. If a member is unable to make the appearance due to health, family or travel issues, you will be refunded 20% back. There are no name changes or size changes allowed.